In Medieval times, Dueholm Abbey, west of Nykøbing Mors, was inhabited by members of the Order of St. John, also known as the Knights Hospitaller. It was established at the initiative of Bishop Svend of Børglum circa 1370 and the name 'holm' derives from its surroundings of meadow and fjord. Like other members of the Danish chapter of Knights Hospitaller, the monks at Dueholm ran a hospital, which served as a form of nursing home for local nobility. Parts of the estate had been bestowed on the abbey as payment by residents for care in old age. 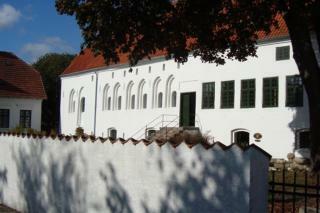 After the Reformation, the abbey was converted into a manor house. Medieval monasteries were decidedly more than retreats for prayer and other religious practices. An abbey such as Dueholm was also the centre of a large, sprawling feudal estate in the region. This estate included a watermill that milled grain from the monastic estate and beyond. What is known today as Dueholm Abbey is in fact only the abbey's old mill house from 1475, which was located close to where the river ran out into the fjord. When the entire abbey itself was torn down in the 1600s, the mill house was turned into the main building for the manor. In 1909, the friars' mill house changed function again, to serve as a museum of local heritage.